The Chinese Paralympic team has powered to the top of the medals table in Rio, sweeping up more than 115 medals in the first five days. Team GB, in second place, has 63. But while the Olympics made household names of many Chinese athletes, as with many countries the same cannot be said of its Paralympians. Despite China having its largest Paralympic delegation ever, with 308 athletes, state media has been muted on their achievements, and Weibo - China's most popular social media platform - is buzzing with comment about the lack of coverage. "It's not even being shown live on television, how are we supposed to watch it?" said one user, whose comment received 6,000 likes. "Come on CCTV, you can do better than this," commented another, referring to China's national broadcaster. "The Olympics were replayed over and over again, now it's hard for me to even catch the Paralympic games on TV," a user chipped in. "Why does hardly anyone know about the Paralympic athletes? My heart aches for them" one netizen expressed. "The Chinese Paralympic team has done so well and yet no one knows about it. They're representing our country too - can we have some equal treatment?" another added. During the Olympics, swimmer Fu Yuanhui charmed hearts with her awkwardness, openness and colourful expressions, as well as her delighted response to winning bronze. Then there was popular gold medallist Sun Yang, whose fans leap to his defence after Australia's Mack Horton called him a "drugs cheat". But few Paralympians have had the same exposure or support. 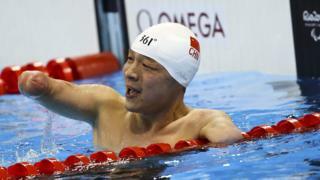 One of the few that Chinese media have focused on is 23-year-old swimmer Xu Qing. Nicknamed The Shark because a tattoo on his back, Xu lost both his arms in a car accident at the age of six but was encouraged to take up swimming by a doctor. He took his first three gold medals at the 2008 Games and went on to sweep four more golds in London 2012. He has claimed three in Rio so far, winning him favourable media coverage and online fans. Chinese netizens have dubbed him the Ten Gold King. "Ten golds! You are our hero," said one user on Weibo. "You are simply brilliant," another commenter said. Reports of other Paralympians are few and far between. Yanping Yuan, for example, won her third Paralympic gold in Rio but is barely getting a mention. The 40-year-old lost her eyesight while at university. But she was already training in judo so joined a national team for the vision-impaired. She won her first medal at the Beijing Paralympics. Four time gold medallist Hongzhuan Zhou, 27, also receives relatively little media attention despite setting a new world record in Rio in the 400m T53 wheelchair race. The sprinter has a leg impairment as a result of polio, which she contracted at the age of three. She already has golds from London and Beijing. The media habit of placing more emphasis on the Olympics is not limited to China. In the US, fans are having to turn to cable television to catch a glimpse of the Paralympic events. Singapore, which has gone on to win two Paralympic medals, has its public broadcaster show daily selected highlights of the Paralympic games, compared to its full live coverage of the Olympics. The coverage is largely blamed on media organisations having fewer resources for the Paralympics, and a reduced public interest. US Paralympic team - should do better?